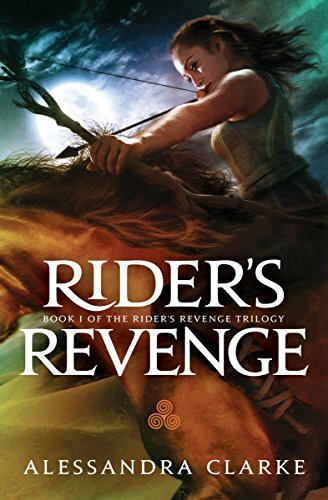 Rider’s Revenge is a novel about K’lrsa (pronounced killrisa), a young woman in the desert tribe known as the White Horse Tribe. She is a rider, one of the best up-and-coming riders of her tribe, who is torn between her responsibilities to her tribe as a First Daughter and her desire to be a full-fledged rider. However, when she is struck by tragedy, she vows an oath to seek vengeance on those responsible, and leaves her tribe, her family, everything she knew and loved behind to fulfill her oath. Along the way, she will make startling discoveries about the world outside of the desert, find something she never thought she could, and will be faced with the most difficult decisions of her life. …Is love worth sacrificing your oath to vengeance? K’lrsa was a great character to read! She is a very strong, independent woman who suddenly finds herself in a world where those very traits that define her are forbidden. Imagine a strong, independent woman today being thrust back into Victorian England, the struggles she might go through as everyone around her, men and women alike, cast her down and try to restrain her from exercising basic freedom. I also like how so much of K’lrsa’s struggle became mired in grays, rather than it being a black and white struggle. It made for an engaging story, and helped me learn more about just what kind of woman K’lrsa really is. Recommendation – yay or nay? That’s all for today. Thanks for reading, everyone! Trials and triumphs of writing, finding an agent, and publication. If it's a Good Movie, it's a Miracle.